Dear Charles - I am interested in the 19th as a man from the Bewdley (Worcestershire) war memorial I am researching is an officer with them. Died of wounds (gas) received at Bourlon Wood on 1st December. Son of Thomas and Mary Jane Baker, of Bewdley, Worcs. Previously wounded at La Bassee, July 1915. St. Sever Cemetery, Rouen, Seine-Maritime, France, B. 3. 17.
at No 8 General Hospital. He attended Bewdley Grammar School. When he left he passed the competitive examination for the GPO in Birmingham. A few years later he passed a higher examination and went to the London office. He was a member of the London University OTC for 18 months and on the outbreak of the war he was with the OTC on Salisbury Plain. His service with the OTC together with his four and a half years as a territorial in the 15th London (Civil Service Rifles) gained him his commission in the 19th London. He went to France in March 1915, and was invalided home in June 1915 suffering from the effect of Lyddite fumes. Upon recovery, he was made Captain in charge of instructing a new battalion. He was offered a staff appointment in Egypt which he declined, preferring to stay with the 19th. He returned to the Western Front and saw much action at Loos, Ypres, Arras, Messines and Cambrai. His bravery was often commented upon. He was the second son of the late Mr Thomas Baker (an old Bewdley name) and Mrs Clinton of Avensbury, Stourport Road, Bewdley. His two brothers were serving in the Royal Engineers and the Navy. I do have quite a good deal more on this officer from his PRO file and the local newspaper (Kidderminster Shuttle) on my home computer, and will forward it if you would like. (I am out of the country for a week next week). If you do have any time to look up Captain Baker in July 1915 / December 1917, I'd be very grateful. Dear Simon - I'd be happy to look Baker up in both War Diaries. I will check to see if he was with the 2/19th in the UK for a while too in 1914/15. This may take a few days as there is a lot of diary. Meanwhile I have coupel of other sources to hand which refer to him. "At about 3 a.m. we stopped work and marched the 6 odd miles back to our billets at Bethune and after a welcome breakfast at my billet I went to bed dog-tired at about 6 a.m. In the afternoon we had a draft of 5 officers from England. Lieut. Fox was posted to A Company, 2nd. Lt. Coates to B Coy., 2nd Lts. Baker and Schonfield to C Coy., and 2nd Lt. Westendarp to D."
"After leaving Givenchy, Lieut. Baker, of C Company, was also invalided back to England with gland trouble." I am writing a social history of the battalion, and one of the things I am looking at is the background, occupation, social class etc of the officers. I would love to have copies of anything about him from his PRO file and from the local papers. I would really appreciate this. Wonderful to hear from you Charles. I realised that I'd seen your name before on the Birmingham University WW1 Studies website. I'm a Friend too, and I think emailing you was somewhere on my mental 'to do' list! I will certainly forward what I have as soon as possible. I am out of the country (Poland!) for the next 8 days, but will contact you on return to Blighty! You might like to email my home address via the forum, and that will spur me to action when I return. Please could i trouble you for a look up in the 2nd/19th Battalion diary. The soldier from my local village was Pte. 6198 J Bagshaw, who died on Wednesday 6th September 1916. You will have seen from SDGW that he had former service in the RAMC. He was in fact one of a batch of 3,000 RAMC men transferred into the infantry battalions of 60 Division in May 1916, c. 270 of whom ended up in the 2/19th. I have written more about this at the start of this thread: RAMC transfers into the London Regiment. He was definitely a Derby Scheme enlistment. From a handful of service records that I have seen for men in this batch, I would estimate that he attested between late October and early December 1915. Depending on his category, he might have been called to enlist almost immediately, or possibly into early 1916. I have checked the published 2/19th battalion history and he is not mentioned in that, other than being listed as killed in the roll of honour (just gives the same date with no further details). His death is unfortunately not mentioned in the War Diary either. On 6 Sept 1916 the bn took over the lines near the Lichfield Crater which is on Vimy Ridge, over 1 mile south of the preserved trenches in the Canadian memorial park. The War Diary entry for that day reads: "We relieved the 2/17th Bn during the night without any difficulty or casualties. During the night a great deal of unusual noise was heard in the German lines." There is no mention of casualties (despite some shelling and one attempted bombing attack on Lichfield crater) until the bn was relieved on the night of 10/11 Sept. Unfortunately not much help. Perhaps he was attached to another unit in 180 bde that day (e.g. TMB, signals detachment etc.) However, if this is the case it is not shown on the medal roll which just gives 2/19th and killed on that day. I would be interested to know if you can add any personal details such as occupation, DOB etc. What is the village? A few days ago you inferred in a different thread that you had identified a few former members of the 2/4th and 2/5th Buffs who went on to serve in the London Regiment. I am interested to learn of any pattern to these drafts? I take it that these drafts were made in the mid to late stages of the war to fill gaps through wastage and loss through KIA and wounded etc.. The Buffs regimental history (Moody) refers (albeit briefly) to these transfers from the 2/5th Buffs to the 20th and 21st Battalion's, London Regiment. I'd be interested to learn anything more about why this was done en masse. I suspect a lot of second line Territorial Force proud Buffs men wearing the "Dragon" were not best pleased to be forced into an obscure London Regiment (although I suspect attitudes changed when they realised their new regiment (Battalions? Never quite sure with the London's) also had a fine and honourable history). As you may already be aware my interest is Ashford and the men who served and died from here. I was wondering if your records could somehow be cross-referenced with our work in some way. It is possible we have info of use to you and vice versa? Is your interest in the London Regiment confined to the 19th battalion (all lines 1/19th 2/19th) or do you have a general interest in that huge regiment! Dave Hughes tells me that you are an internationally acknowledged (dare I say it "expert") on the London Regiment. ... you had identified a few former members of the 2/4th and 2/5th Buffs who went on to serve in the London Regiment. I am interested to learn of any pattern to these drafts? I take it that these drafts were made in the mid to late stages of the war to fill gaps through wastage and loss through KIA and wounded etc.. The Buffs regimental history (Moody) refers (albeit briefly) to these transfers from the 2/5th Buffs to the 20th and 21st Battalion's, London Regiment. I'd be interested to learn anything more about why this was done en masse. Thanks for your post. I would blush at being called an 'internationally acknowledged expert' on anything! I do have a general interest in the London Regiment, but my specific interest is the 19th, my grandfather's battalion, hence the database and war diary transcriptions. Yes, I would love to swap info. I have identified 10 men from the Asford AVL who served with the 19th. I think they were probably all part of this block of Buffs. I have also found 5 of my men on the Dover War Memorial, and another in a Dover Cemetery. Another 2 appeared in the Folkestone/Hythe AVL. I am still trying to work out the patterns of enlistment and drafting, and dont yet have the definitive answer, but I am making steady progress. of Jan and May 1916 removed the ability to serve at Home only, as well as the restrictiion that men could only be psoted into the same Corp. Some may also have been held back on account of being under age, or medically not fit enough until they were 'combed out' in mid 1916. A handful of them have lower numbers and appear to havse served on the W Front before the 19th, so are presumably returning after wounds. As I dont know that much about the numbering of the Buffs, much of the above is reasonable specualtion, and would need a good sample of service records to confirm. I would be very interested to see what Moody has written. Mazingarbe	10/11/1915	Battalion in reserve trenches 10th Avenue. Relieved the 18th London Regt (London Irish Rifles) in front line B2. Relief carried out very expeditiously. No casualties. Unfortunately there is no surviving battalion War Diary for Oct 1915. I am trying to piece together how it might have looked from the Brigade War Diary. I will pick this up in another post. From the Silver War Badge Roll I have the same enlistment date i.e. 22/6/1915. The SWB Roll also says that he was discharged sick 3 Jan 1916 with SWB number 35972. The roll of the British War & Victory Medals for the 19th give his dates on the Western Front from 10/10/1916 to 10/11/1915. I would be very interested to see what his service record actually says. (I would love to see a copy and would be happy to pay photcopying and postage costs.) From your post above the details appear to differ from the medal rolls - you say wounded and arrived in France 27/28 Oct. The service records are more accurate than the medal rolls. I have information on the number of casualties each day for the 19th in Oct 1915 taken from the 141st Brigade War Diary. If you can clarify whether wounded or sick, and the dates from the service record, I may be able to give you a better idea of what happened in late Oct. Thank you for such a quick response.You are very welcome to a copy of the records. to France are repeatedly given, left England 27/10/1915, arrived France 28/10/1915. Returned to England 10th/11th Nov 1915. His Injury was GSW to the arm. Thanks for this - looks like the SWB roll is definitely wrong. I would say that he was wounded on 30 or 31 Oct - the 1/19th took casualties both days. I just tried sending you a PM, but got a mesage saying that you have disabled the PM facility. I would certainly love to see his records, thank you. My email is chasf@tinyworld.co.uk. I am on broadband so can take large files. In return I can send you the relevant pages from the 141 Brigade War Diary which show the casualties suffered by the battalion at the end of October 1915. Thank you very much for the 141 Brigade War Diary pages, the information is brilliant. me in the right direction to find it. Thanks again for the Diary Pages, really useful information. 1/19th War Diary now fully transcribed into an Access database. I have read with interest the posts regarding his regiment and would be very grateful for any further information. My father remembers hearing mentioned the Buffs and having seen the post regarding this i wonder if he could have been one of those who became part of the 1st/19th London Regiment. I have obtained his medal index card and it says he went to France on 10/03/15 and that he was killed in action on 25/09/15. He is commemorated on the Loos memorial. That would be Private 3050 Stephen REDDING. I can tell you a little more. 2) His enlistment date was 12 Sept 1914. I know this since numbers were issued sequentially, and I have confirmed enlistment dates for that day for men both before and after him in the numerical roll. 3) SDGW gives place of enlistment as Camden Town. In fact he would have enlisted at the Battlion HQ, which was 76 Camden High St. The building has since been destroyed (either by the Luftwaffe or by development) and a branch of Argos now stands on the site. 4) He would have first have joined the second line battalion of the 19th Londons, later called the 2/19th. This battalion started recruiting from about 1 Sept and its complement of 1,000 men was complete within 2 weeks. Your ggf would have been one of the later enlistments in this battalion. The 2/19th was based in the White City area until 2 January 1915 when it moved to Reigate in Surrey. 5) At that stage of the war, the role of the 2/19th was to provide drafts for the 1/19th which was preparing to go to France, which it did on 9/10 March 1915. Your ggf was therefore one of the 10th March men - the originals of the 1/19th who arrived in France that day. Your ggf must ahve been transferred from the 2/19th to the 1/19th sometime in late 1914 or early 1915. 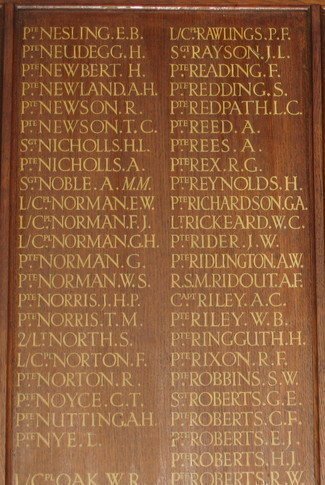 6) He is commemorated on the Regimental War Memorial which is in the vestibule of St Pancras Church. If you can make it to the church on 11 November this year the OCA is holding a service there and you will be able to see it. There is a good probability that he took part in some of the other actions of the battalion in 1915, such as near Givenchy. I have the War Diary for the 1/19th which I can send to you by email. If you haven't already, you should try and find his service record in the National Archives. There is only a 30% chance that it survives, but if it does that will answer many questions. You may be interested to know that the Old Comrades Association for the 19th is still going strong. We have held battlefield tours to the sites of significance for the 19th in each of the last 3 years, including to Loos for the 90th Anniversary on 25 Sept 2005. If you send me an email via the forum (go to my profile) then I can send you the most recent newsletters by return, as well as the 1/19th War Diary for March-Sept 1915. I also have a photo of the panel from the Loos Memorial. 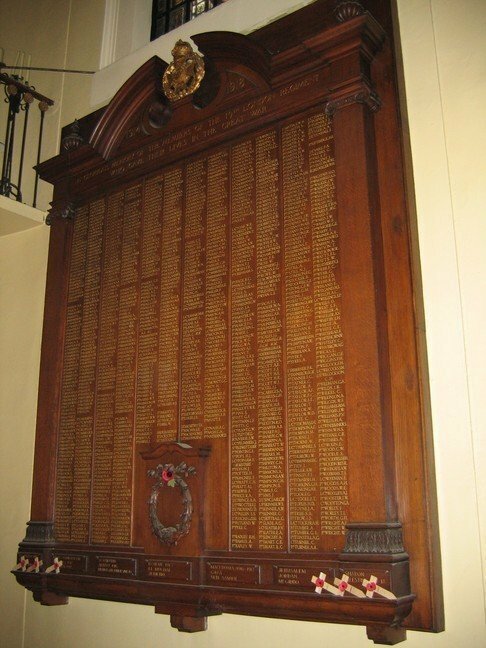 ... and the relevant panel from the War Memorial in St Pancras Church. The Regimental War Memorial in St Pancras church. Yourr ggf is almost at the top, exactly 1/4 of the way in from the right. Interests:First and Second World Wars, France, Flanders and Gallipoli. Medical Services. Enjoy researching individual soldiers and tracing their probable movements on the battlefield. I wonder if you can tell me when 63195 Pte James Stelling transferred into the 19th Bn, died 01/09/18? I believe he was injured 3 or 4 days before dying, his brother, Lupton, died four days before him. Any chance of extract from WD for period 25th-28th Sep 18? I'm off to Somme early Monday but no hurry, I'll be over again in Feb 08. Thats a good question. 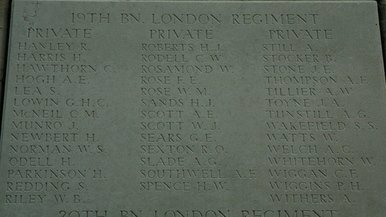 Of the fatal casualties to the 1/19th Londons in the 100 days, both SDGW and CWGC records indicate that 2/3rds of the dead were in fact Middlesex Regiment men who were attached to the 19th. In most cases they have Middx headstones which say "attached 1/19th London". If not, it says this in the cemetery register, which is backed up by the medal roll entry in the Middx. The 19th Londons were affiliated to the Middx, so there was a lot of interchange between the two. Acheux 09/04/1918 Battalion resting. Draft of 3 officers (Capt LE PEPPIATT, Lt SC JA and 2/Lt EA CLARKE) and 646 other ranks arrived. Capt JJ SHEPPARD MC assumed command of the Battalion. I have checked the 141 Brigade and 47 Div A&Q diaries, and there are no other large scale transfers recorded, so I feel fairly certain that this was it. The battalion has very quiet time the next few months as it was mostly out of the line rebuilding and training, and its next action was the 47 Div attack at Happy Valley just north of Bray on 22 August 1918. I don't have any record of his brother - I didnt come across him when I went through the Middx rolls. Do you have a connection with Stelling? If so, I would be grateful for any info that you can shed re his background etc. Please send me an email (not a PM) via my profile on the GWF today, and I can send you the War Diary by return.